Dermaplaning is a safe exfoliation technique that refinishes the epidermis through a controlled scraping. The procedure aids in correcting scars, pigmentation and fine lines. Fine facial hair is also removed in the process, leaving a youthful and vibrant complexion. Typically there is no down-time experienced. Following the procedure, you may return to normal activities immediately. Some individuals may experience slight redness, which quickly subsides. Dermaplaning is not painful or uncomfortable when performed by a medical professional trained and certified in Dermaplaning. 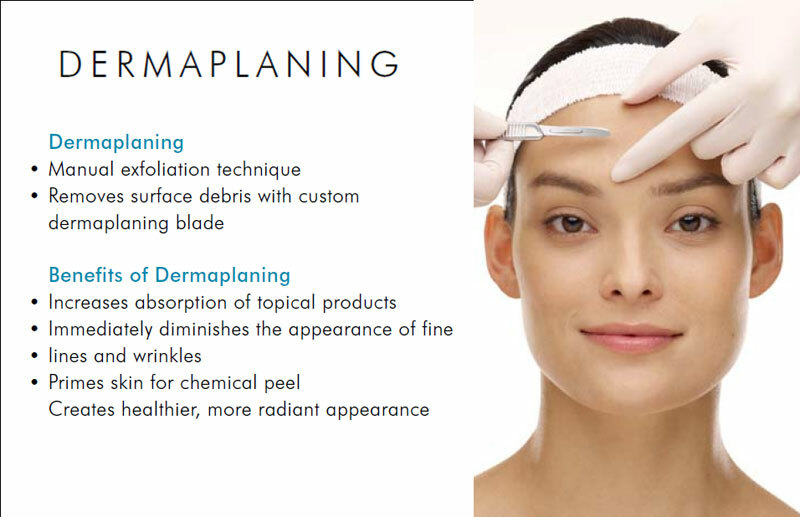 Try Dermaplaning and see for yourself. The skin benefits from rotating treatments giving your skin a “change-up” and get the best anti-aging results possible. We encourage sunblock with ALL facial treatments! !